The Ukrainian Greek Catholic Church celebrates the Divine Liturgy—the Eucharist—and other sacraments according to the Byzantine rite, a liturgical system composed in the fourth and fifth centuries AD in Constantinople, the imperial capital of the eastern Roman empire.1 The Byzantine liturgy is a common inheritance of Eastern Orthodox and Eastern Catholic churches, including the Ukrainian Greek Catholic Church. Its beauty is said to have been the decisive factor that dazzled emissaries of the pagan Kyivan Prince Vladimir, who saw it in Constantinople and “did not know whether they were in heaven or on earth.”2 Vladimir’s embrace of Byzantine Christianity in 988 was a signal moment in the spread of Byzantine Christianity to Ukraine, Russia, and nearby lands. As the oft-told emissaries’ story recounts it, it was the form of worship, seemingly more than the theology or any other factor, that converted the prince. The Byzantine liturgy, translated into Slavonic not long after it was introduced in Kyiv, aims to invoke splendor and glory, to envision heaven here on earth.3 It takes place both behind and in front of an iconostasis, a gold screen covered with icons that separates the altar and sanctuary from the main body of the church, and has three doors for celebrants and servers to move through. The central, double set of “royal doors” open to give passage to bishops and priests, and give a partial view of the altar. The single “deacon’s doors” on each side of the main door provide passage for servers. Incense and chant play significant roles in arousing the experience of worship. The most frequently used form of Byzantine liturgy, the Divine Liturgy of Saint John Chrysostom, dates to the beginning of the fifth century, though it builds upon prior forms. It is celebrated on most Sundays. The Divine Liturgy of St. Basil the Great, an older and longer form, is used on certain key feasts, 10 times in the course of the year. 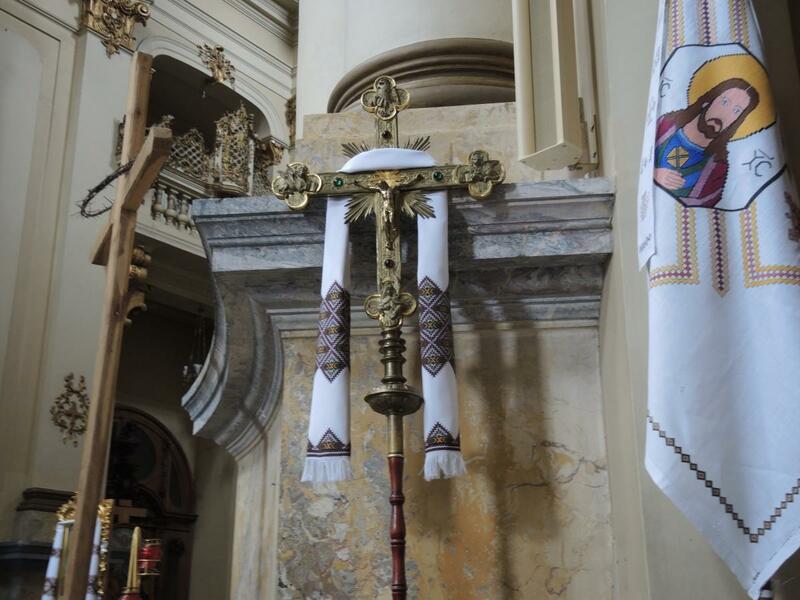 A third liturgy, the Liturgy of Presanctified gifts, differs in that it does not include an anaphora, a prayer of consecration, and uses reserved Eucharistic bread.4 This liturgy is used on a variety of days during Great Lent. Vespers, the tradition of sung psalms and hymns, are also an important part of the Byzantine liturgical tradition, not only for monks, but also as part of worship on occasions like Christmas Eve. Though the Byzantine liturgy dates to the fourth and fifth centuries, it has undergone some changes over time, beginning in early Kyiv when Church Slavonic was adapted as the language of worship in place of Greek. The liturgy is still in the process of change today as the Greek Catholic Church charts a course of re-Byzantinization to remove Latin-rite influences and to be more authentic to its Kyivan heritage. Even as it is being Byzantinized, in some places it is also adapted to local contexts in other ways. 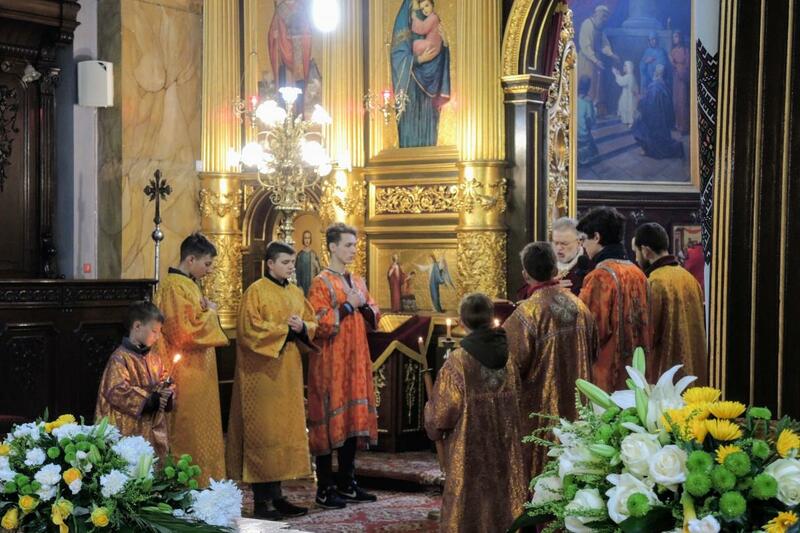 Given that Church Slavonic is otherwise archaic, the Divine Liturgy is generally celebrated in the local vernacular today (Ukrainian, English, etc. ), or even, in the diaspora, in a combination of these, to accommodate different generations with different language abilities. The use of the vernacular distinguishes Byzantine Catholic from Orthodox liturgy. In Lviv, Ukraine, clergy sometimes reported that elements of some services have been shortened because the length was more suitable to monastic or to village life than to urban life. 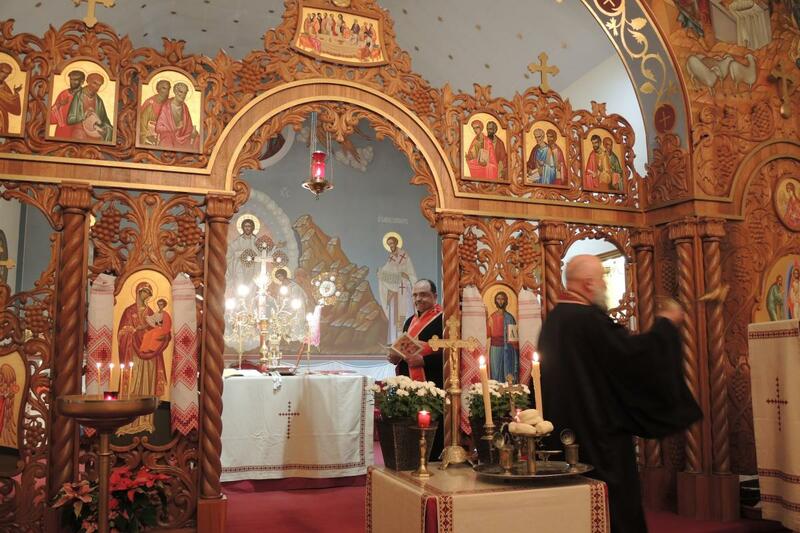 Whether by village standards or wealthier urban standards, the church that provides the setting of a Byzantine liturgy is designed to convey glory and to be a meeting place between heaven and earth. Byzantine worship especially relies on the use of images and beauty to lift worshippers’ attention to the heavenly, immaterial realm. 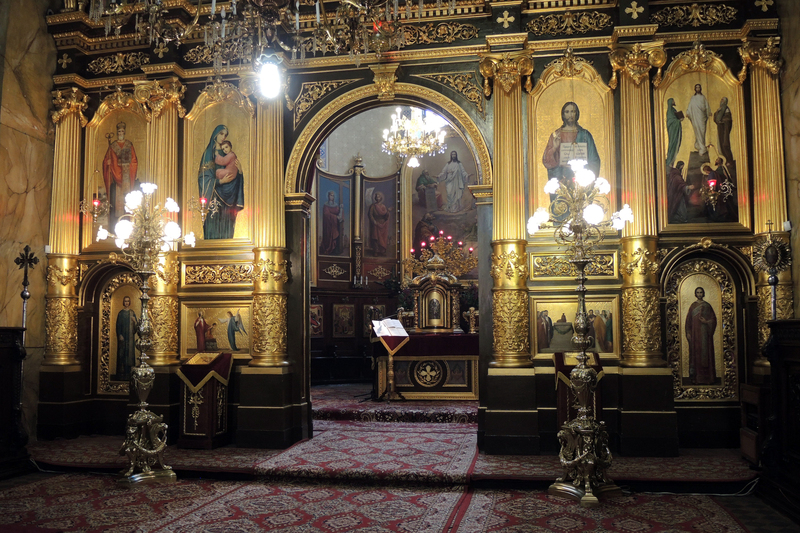 The first thing one might notice is the iconostasis, or icon screen, resplendent in gold and covered with icons. The presence of the iconostasis means that the laity does not normally witness many parts of the eucharistic liturgical celebration. Some churches, however, are designed to allow a better view of the sanctuary. 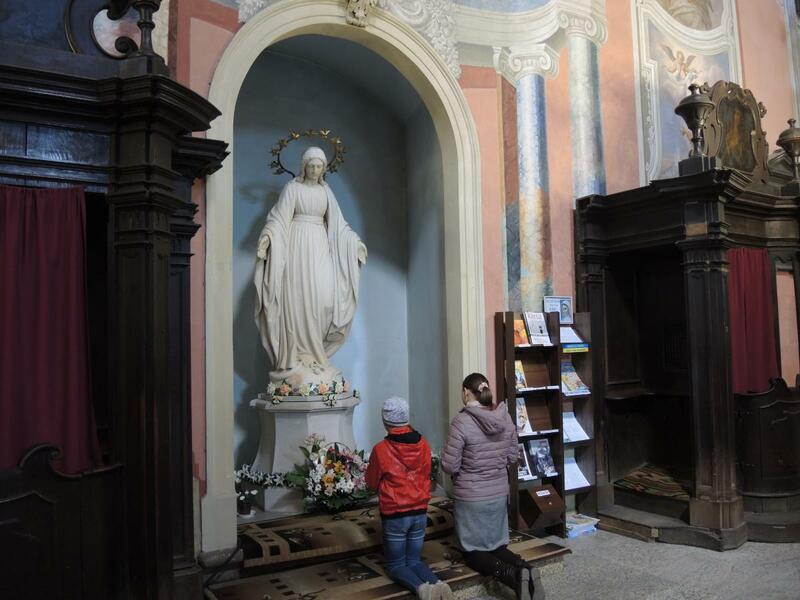 In Lviv, many churches built during the eras of Polish and Hapsburg rule were not designed with space for an iconostasis, but added one later. 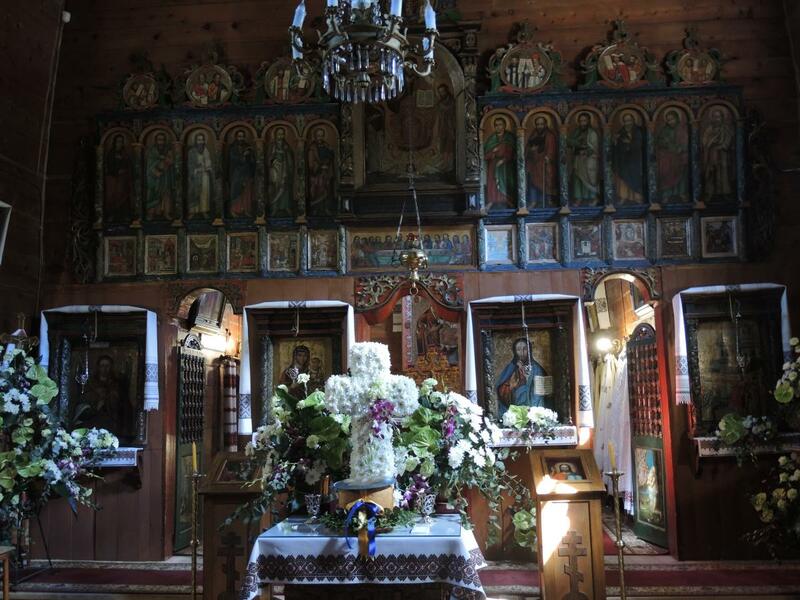 While many such churches use elaborate sculptural architectural elements, including on the icon screen, the saintly imagery of Byzantine churches is supposed to be represented exclusively through two-dimensional, painted icons, not through statues. The altar, which is freestanding but is behind the iconostasis, is square. A tabernacle is placed on the back side of the table. The priest celebrates in elaborately embroidered vestments with his back to the people during much of the liturgy, while the deacon and other celebrants face the altar from the side. Though many churches in the diaspora have adapted pews in at least some parts of the church, the tradition is for worshippers to stand throughout the service, which can last from one hour to several hours. 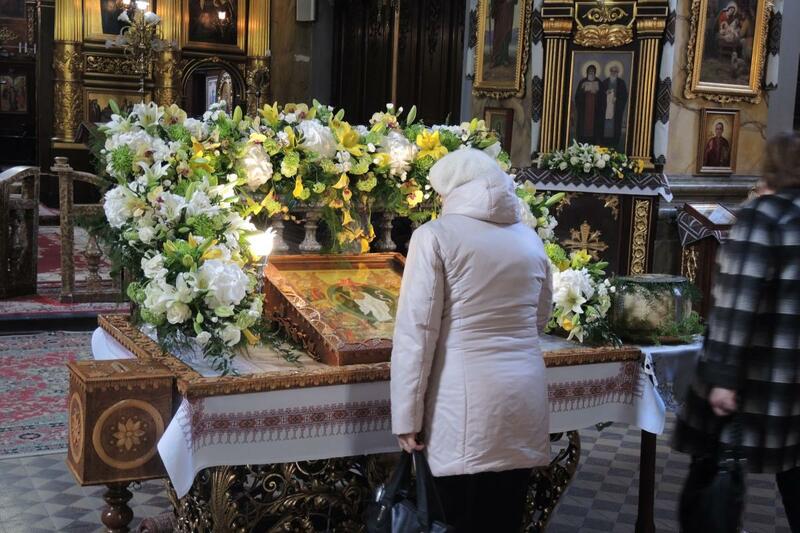 The Divine Liturgy of Saint John Chrysostom, the most frequently celebrated form of the liturgy, provides a good introduction to Byzantine worship in the Ukrainian Greek Catholic Church. The language of the liturgy is designed to convey God’s magisterial divinity. The liturgy invokes God, “Whose power is beyond comparison, Whose glory is beyond comprehension, Whose mercy is beyond measure, and Whose love for mankind is beyond expression.” “You dwell in the holies,” it continues, “with three-fold cries of holy the seraphim acclaim You, the cherubim glorify You, and all the heavenly powers worship You.” Even in (and perhaps through) such transcendent language, believers also see God present in their midst. As the liturgy of Sacrifice builds to its central moment, the altar is incensed, and the priest leads the anaphora, the prayer of consecration, facing east, i.e. with his back toward the people. Afterwards the altar is incensed again. Following more intercessions, the Our Father, and repeated prayers that “God be merciful to me, a sinner,” believers approach for communion. They kiss an icon before the altar, and announce their Christian name to the priest so that he may use it when distributing communion. Communicants do not respond Amen, but simply tilt their heads back a bit so that communion can be dropped on their tongue by a priest using a long, golden spoon which contains both the communion bread and wine. With a turn of the spoon, communion is placed there without the spoon touching their mouths. Communicants make a sign of the cross, and bow. Following a series of prayers of thanks, the liturgy ends with a dismissal. The Divine Liturgy of St. John Chrysostom strikingly includes almost two dozen prayers for peace. There are four prayers for the Pope and for the bishops and clergy, compared to one in the Latin rite. Chant is integral to the liturgy. Almost the whole of it is chanted, even the Gospel reading. Liturgical music is solely dependent on a capella singing, not on musical instruments, including the organ. A cantor and choir does much of the chanting, along with the celebrants, though some people do join the chant at a lower volume. 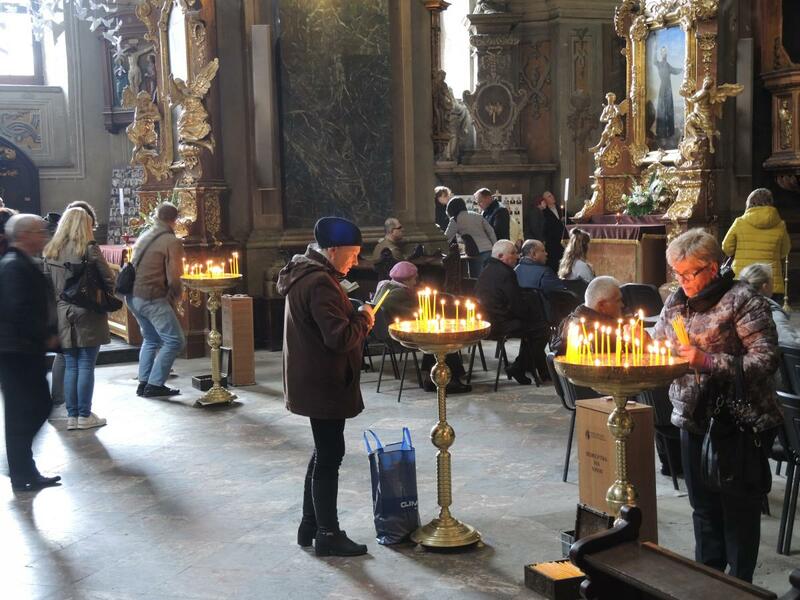 The posture of prayer for lay people at prayer during the liturgy differs significantly from Roman practice. Traditionally there are no pews in church, though as the Christmas Divine Liturgy video from Canada shows, some churches in the United States and Canada have adopted pews. 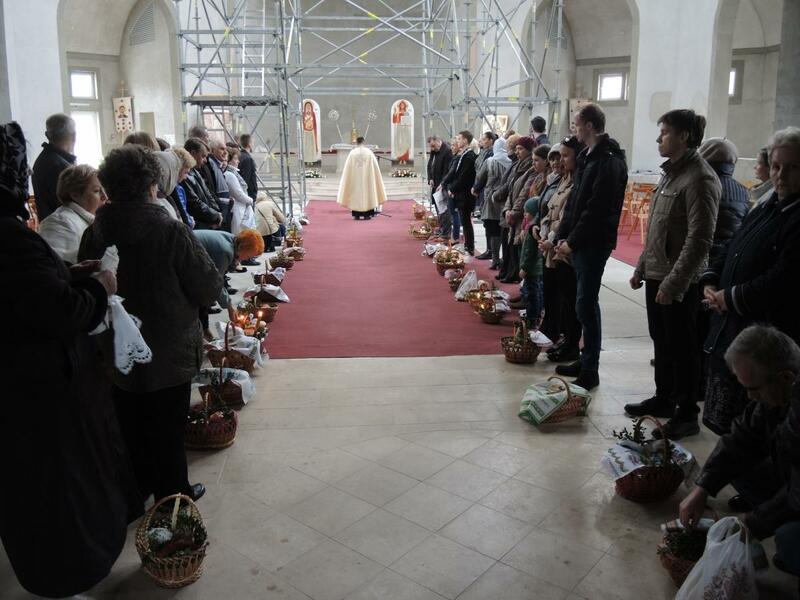 Other than in those contexts, lay people stand throughout the open body of the church for up to two hours during the liturgy. Kneeling or sitting, including at the consecration or when receiving communion, is not part of the tradition.10 In that sense, the range of worshippers’ movement is more limited. For the clergy, however, the liturgy is much more processional. Celebrants process around the altars, through the doors, and out into the body of the church frequently, much more than in the Latin rite. On the other hand, despite the time most lay worshippers spend standing still in the church, worshippers have a different kind of freedom of movement than in the West. 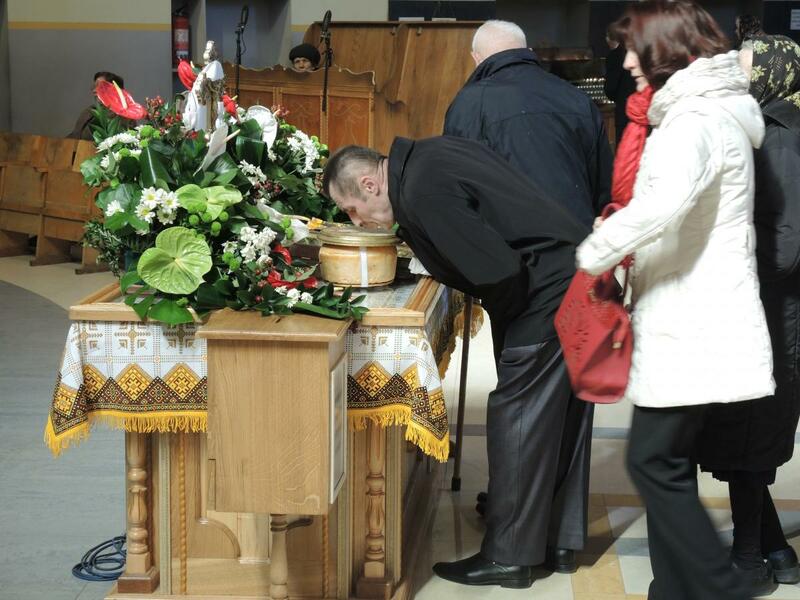 They are not at all out of place if they walk forward or elsewhere in the church during the liturgy to light a candle or to venerate an icon, even one displayed in front of the altar. The most frequent outward sign of gesticulation for lay people integral to the liturgy entials marking themselves repeatedly, at assigned times, with the sign of the Cross. When Byzantine Catholics mark the sign of the Cross across their bodies, moving their right hand from head to torso to shoulders, as Catholics commonly do in prayer, they move their hands from right to left to form the bar of the cross, not left to right, as Roman Catholics do, with their thumb and first three fingers held together to mark the Trinity, rather than in the flat-fingered fashion of Roman Catholics. Eucharistic exposition is not considered traditional part of the Byzantine rite. 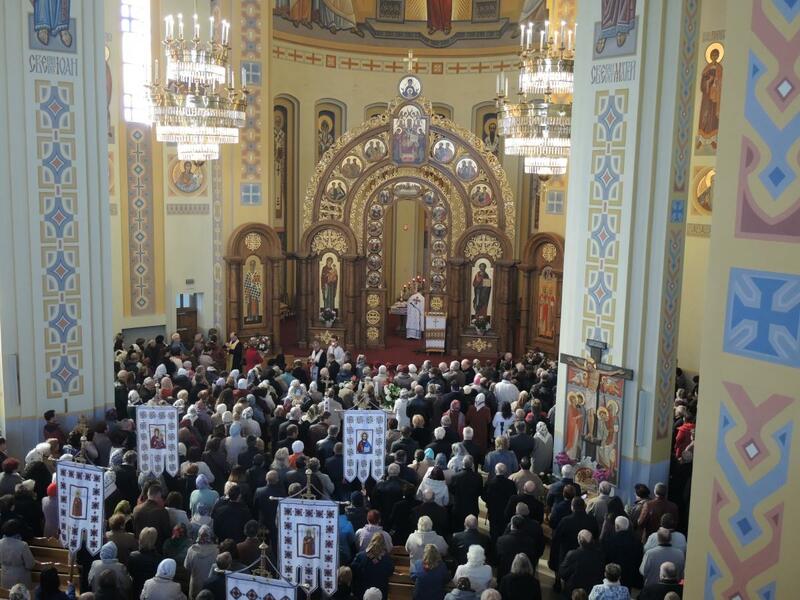 The Ukrainian Greek Catholic Church follows its own calendar of sacred commemorations throughout the year. Because the Church has its own process of canonization and selection of feasts, the lists of saints commemorated in the Ukrainian Greek Catholic and Roman Catholic calendars have very little in common, except for the 12 major feasts of the Ukrainian Greek Catholic Church: the Nativity of the Mother of God, Exaltation of the Holy and Life-Giving Cross, the Entry of the Most Holy Mother of God into the Temple (in the Latin Church, the Presentation of the Blessed Virgin Mary), Nativity of Our Lord (Christmas), Theophany (Epiphany), Presentation of Our Lord in the Temple, Annunciation to the Mother of God, Palm Sunday, Pascha (Easter), Ascension of Our Lord, Pentecost, Transfiguration of Our Lord, and Dormition of the Mother of God (Assumption). Some of the major feasts, and a few other saints’ feasts, share the same dates between Latin rite and the Ukrainian Byzantine calendars, but depending on the country where a church is located, the celebration of the Nativity, Theophany, Palm Sunday, Pascha, Ascension and Pentecost can be based on the Julian calendar, the original Roman calendar that predated the Gregorian calendar, or on the Gregorian calendar that the western churches use. 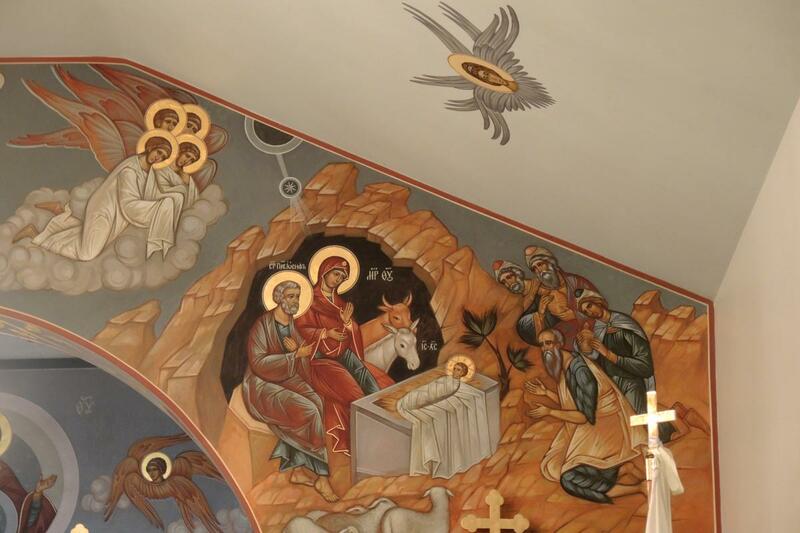 In Ukraine, the Julian calendar aligns Greek Catholic with Orthodox celebrations, whereas in the diaspora the situation varies: in Canada the Nativity is celebrated January 7, whereas in the United States it is celebrated December 25. The Byzantine tradition begins the year on September 1, rather than at Advent, as the Roman rite observes. The period of preparation for the Nativity, known as Pilipiwka or Pylypivka, Philip's Fast or Nativity Fast, equivalent to Advent in the Roman rite, begins on November 15, and as the name suggests traditionally includes fasting and abstinence. December 6, the feast of St. Nicholas, though it falls during the fast day, is the day (rather than on the feast of the Nativity) when St. Nicholas, the progenitor of Santa Claus, brings gifts. Great Lent, a 40-day period of fasting and abstinence, leads up to Easter. Unlike the West, there is no celebration of Ash Wednesday. Just as many of the saints celebrated on feast days in the Roman rite, whether in the Americas, Africa or Asia celebrate many early saints linked to western Europe, so too does the Ukrainian Church calendar honor a large number of saints in common with Orthodoxy, generally from the Eastern half of what was once the Roman Empire and from Slavic lands. 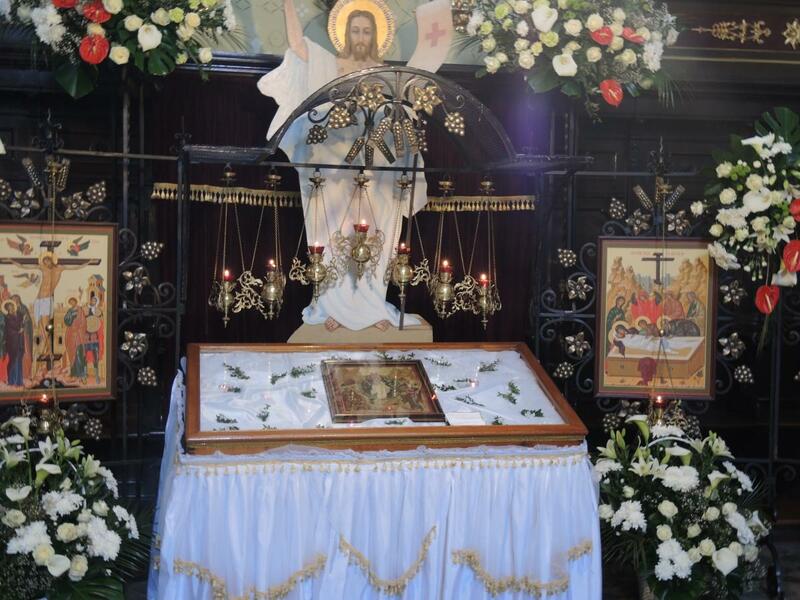 A full calendar of feasts gives those more familiar with the Roman rite a good sense of how different the canon of saints commemorated in the Eastern liturgy is. Baptized children of all ages can receive communion from initiation onwards. Still, in both Ukraine and North America, at least, the Latin Church’s practice of First Communion is held even though children have already received communion at their baptism. In a sort of coming of age ritual, they are dressed up for a ceremony to receive the sacrament.15 Chrismation is not practiced for teens as a coming of age ritual the way confirmation is in the Latin Church. 1. The Eastern Roman empire, which long survived the breakup of the Western Roman empire, was subsequently known as the Byzantine empire. Before being named Constantinople in honor of the emperor, its capital was called Byzantium. The Patriarch of Constantinople (the city known today as Istanbul), is the spiritual leader of Eastern Orthodoxy, the “first among equals” of the various Orthodox churches, though that status has been challenged to the point of excommunication by the Moscow patriarchy, over the status of an independent Ukrainian Orthodox church, which the Patriarch of Constantinople recognized in 2018. 2. Robert F. Taft, S.J., The Byzantine Rite: A Short History (Collegeville, MN: Liturgical Press, 1992) 16-28. 3. Taft, The Byzantine Rite, 18. 4. This liturgy is first described in the late sixth century by Pope Gregory the Great. On Good Friday, the Latin rite church also celebrates its liturgy with pre-consecrated, reserved Eucharistic bread. 5. Juraj Buzalka, “Synchretism Among the Greek Catholic Ukrainians in Southeast Poland” in Churches In-between: Greek Catholic Churches in Postsocialist Europe, ed. Stéphanie Mahieu and Vlad Naumescu, (Berlin: Lit, 2008). Vlad Naumescu, Modes of Religiosity in Eastern Christianity: Religious Processes and Social Change in Ukraine (Berlin: Lit, 2007) 102-103. 6. The use of leavened bread is in contrast to the Latin rite, for which unleavened bread must be used, according to Church doctrine. 7. Daily readings and other notes on daily liturgy can be accessed at http://stjosaphateparchy.com/typikon/. 8. 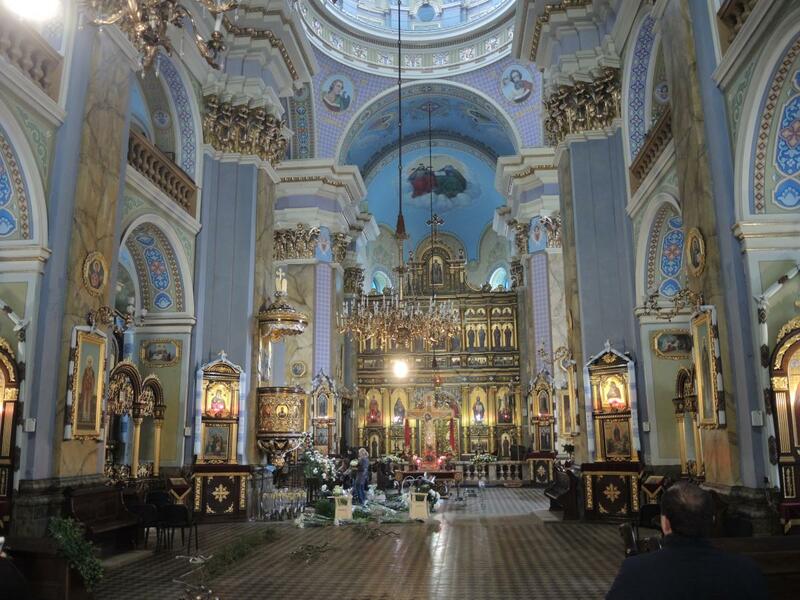 On these and other contemporary Ukrainian Greek Catholic practices in the United States today, see Mark M. Morozowich, “The Liturgy and the Ukrainian Catholic Church in the United States: Change through the Decades,” U.S. Catholic Historian, 32, no.1 (2014): 49-69. 9. Mark M. Morozowich, “Tradition or Innovation – An Analysis of Recent Liturgical Developments in the Ukrainian Catholic Church in the United States,” Worship 86, no. 1 (January 2012): 27. 10. 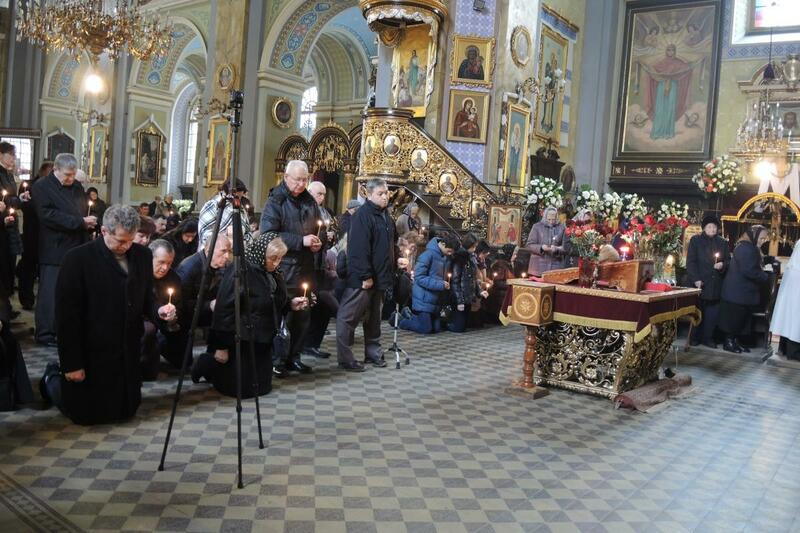 Kneeling did become part of many Ukrainian Greek Catholics’ practice at different moments in history, not only in the United States and Canada, but under lands with heavy Polish influence. In light of the current Vatican-endorsed move toward “re-Byzantinization,” it is not encouraged today. 11. Vlad Naumescu, Modes of Religiosity in Eastern Christianity: Religious Processes and Social Change in Ukraine (Berlin: Lit, 2007) 158-9. 12. Taft, The Byzantine Rite, 16. 13. Morozowich, "Tradition or Innovation," 31-33. 14. An English version of the ceremony and text is at http://stjosephukr.com/mysteries/baptism/full-service-text/. A version of the sacrament of repentance, in communal form, is at https://www.royaldoors.net/2013/07/the-order-of-repentance-a-penance-service-according-to-the-byzantine-rite/. 15. Juraj Buzalka, “Synchretism Among the Greek Catholic Ukrainians in Southeast Poland,” 196; Vlad Naumescu, Modes of Religiosity in Eastern Christianity: Religious Processes and Social Change in Ukraine (Berlin: Lit, 2007) 160-61. 16. A translation of the text is available at https://www.royaldoors.net/2013/07/holy-mystery-of-marriage/.